I recently saw this video of the Voice Actors of the 2012 turtles saying their goodbyes and was really touched seeing them thanking us fans for supporting them over the years. So I decided to make this thread, so that we can talk about what we loved about the Nick tmnt cartoon and look back on/share the good memories we had with it, just like with the Fred Wolf Appreciation thread. I hadn't seen that video before, it was really nice to see the voice actors say goodbye to fans and give us some last words as their series came to a close. You can really tell the voice actors really loved the show and voicing the characters, it's nice that in the modern year of nearly 2018 we can have voice actors say goodbye to fans when their show ends on videos or social media. Back when the original cartoon ended in 1996 we couldn't get that since there was barely any internet. Either way with Rob Paulsen as voice director for the 2018 show, and the possibility of a crossover, I don't think we've seen the end of the 2012 Nick Turtles forever. They'll surely be revisited in some form, even if it's not until years down the line. Why not, the other toons have an appreciation thread, I think? They posted these separate on Twitter the night before the final airing, or the day. I think some of the VA's really did love doing this show, Cipes for sure but also Astin and Paulsen and I'm sure others. watched the video this morning, I must say it does make me even more sad to know that this series is over. I've loved this run from the beginning. Why does he only thank Kevin Eastman? Peter Laird at least co-created TMNT. Okay, so this is an appreciation thread, so what do we like about it? (those of us who like it or at least some things about it.) Obviously we can pick what we do and don't like or prefer in other incarnations etc but to start with. btw, I also like some of the other version stories and takes on things so when I am listing what I like about this show, I am not knocking any other, I'm just saying what I liked here. I like the designs first off, the turtles look, their faces, eye colour, I know you guys won't like this but I like the three toes, not because there are 3, I mean their none protruding design.. remember this is my first real experience of the turtles so I wasn't already used to them having 2, I am now used to seeing that in the others. I liked some of the other character designs too. I liked a lot of the VA's, Turtles, Splinter and Shredder mostly.. I liked that Splinter was younger, taller and one badass sensai. However, I like Splinter in other versions, again, it was a nice change for this show. I liked the 'brothers' story of Yoshi and Saki, that Karai was Splinters daughter, yet Shredders too. I like the theme song and some of the music throughout. 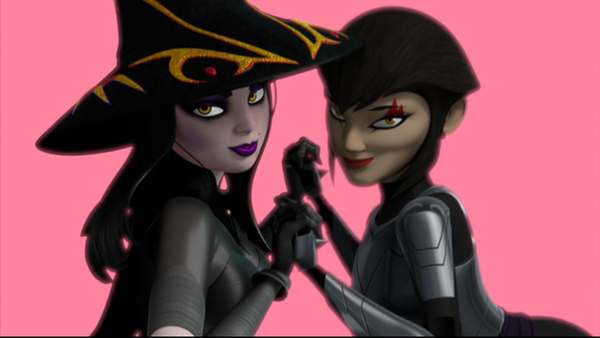 Also, that the 'friends' (inc Karai) were all teens like the turtles, not needed every time but was a nice change. I'd probably better stop there as I have to go out, and I'm likely boring people as you've likely all discussed these things anyway ..
Last edited by newfan; 12-19-2017 at 08:09 AM. I also like GCI for this this toon. It's great to have three different series, each animated in different style. I think this series really nailed the personality and fragility of the turtles themselves. They felt like kids growing up over the course of the series - sometimes smoothly, sometimes very awkwardly. While some of the turtles character traits were done a little over the top (looking at you Mikey), overall they were really spot on. I like that Donatello got much more of a central and more importantly, a varied role in this series. He's far too often relegated to tech guy and thats it. Love it or hate it, Apritello brought out a massive new perspective for this character that was only danced around prior. In a similar vein, I also really liked that Raph's other personality traits were explored more - though there was definitely room for improvement, it was a good step in the right direction. The Nick Shredder and Splinter were easily among the best iterations of those characters. Both were compelling, mysterious and had great scenes and dialogue. I liked almost all the new mutant regulars. Rahzar, Fishface and Tigerclaw particularly were great characters, albeit they did become underused as time went on. Equally, Bradford and Xever were just as interesting and arguably it was a shame they were mutated at all. The background music for this series was excellent. Its a shame its so subtle that few people mention it often. The backing track was truly superb. The animation towards the end of the show was also really, really well done and the choreography of the some of the fight scenes put some hollywood productions to shame. The voice acting was consistently excellent - despite the cast problems with Leonardo. I cant think of a single instance where the voice over work came across badly, was a bit stiff or was poorly acted. Agreed with a lot of that Tarris, the turtles growing up throughout the series, the fight scenes and also some of the new characters. I loved many of the Original Characters in this series. Tiger Claw was awesome, Xever/Fishface was also cool but my all time favourite has to be Don Vizioso despite him being pretty minor. We need more interesting mob boss/gangster characters. They were not that good in the Original Cartoon but the Nick cartoon shows that even they have potential. Shinigami was the best new character, I'm glad Karai had a great love interest in this series. Hopefully she returns in future incarnations. Time to scour the likes of tumblr and deviantart to find the shipping communities! Agreed, (with Fredwolf, Cubed posted before me) while the writers seemed to like people having ships there was no confirmation of that, that hand clasp in the video was just a brief moment, it looks more in capture... still, your ship, take it as you like. my all time favourite has to be Don Vizioso despite him being pretty minor. I found him a little gross but character-wise, yes having another who wants to take the city besides Shredder. Last edited by newfan; 12-21-2017 at 03:58 PM. [url]Time to scour the likes of tumblr and deviantart to find the shipping communities! oh gosh, that would be a nightmare! I wonder if people ship Nick Bebop and Rocksteady as well? Not gonna link anything here, but I can PM you something that will help you keep that stuff outside of discussions about the canon. You can get some... uh... Relief? This is one of the incarnations I liked the most. In the beginning the Turtles are children on the cusp of manhood. They have spent their whole lives in the sewers, no matter how big the sewer system is in New York City the dank tunnels aren’t enough for them anymore. They want to see something new, something exciting, they want to go out and find their place the world and so their journey leads them outside to the surface. At first the city is their new world, but despite being warned that the world outside their sewer home is dangerous they still show a nievity toward it. Resulting in one of them finding the girl that would see as the love of his life. Gaining an enemy in the Kraang, and even worse accidentally drawing the attention of a foe from their fathers past. From here their lives are divided. They come to see that while the world around them will never see them as people there are a precious few who can learn to see them as friends. But even more so there are those who will see them as enemies simply because they exist. They will also let their own confidence get the better of them only to result in one friend leaving them for a time and numerous other innocent people being mutated. As things progress they gain an ally from someone they originally saw as an enemy. And experienced their first great upset in the supposed death of their father, the near death of one of their own, and the loss of city in which they lived. Forced to live outside the city, they are able to live relitively normal lives for a time, but much like the sewers they are still religated to the grounds of the farmhouse and the acreage surrounding it. Struggling with the losses brought upon them they eventually find the resolve to return and reclaim what they have lost. But even with the defeat of the Kraang, they feel they have one less enemy to deal with until they realize that the Kraang have returned and another threat to their world arrives from far beyond their planets solar system. This again results in the loss of their father through litteral death as well as the deaths of millions of innocent humans as they are sucked into a black hole. The four turtles and their human friends once again find themselves with an opertunity to flee with their lives. But the loss waying upon their sholders is a heavy burden, because they failed and survived while their father and everyone else on their forsaken planet was doomed to a fate worse then death. The person who saved them however says there is a way to change the past as he leads them back six months in time. Over the course of the jouney the six companions largely depend on one another in worlds that are outside of their understanding. They befriend some, make enemies of others, and are betrayed by two people they have come to view as friends. But they managed to disrupt the failures of the past. Unfortunately these times are not last, as their greatest enemy undergoes mutation himself in order to defeat them. And things become worse as one of their own becomes corrupted and another one of their own is destroyed as a result. And lastly their greatest enemy wins by slaying his former friend and this time the act is perminant. Armed with only each other the six companions face off in a final confrontation against their great enemy and defeat him for good. Now the four turtles are no longer children, they have become full grown men. They have earned their places in the world and live to protect it and the allies they have gained only makes their family stronger. Also in previous incarnations the Turtles have basically one character trope, Leo the leader, Raph the Muscle, Donnie the Brains, and Mikey the Joker. This time these tropes are taken, but they are added to. Leonardo is the leader and big brother. Both are roles he struggles with. As a young boy he had always known he was destined for leadership, and strives to follow his fathers instructions as they have been thought as he feels it is his duty. However big brother and leader are two different roles. Sometimes he would act as a brother or a leader successfully. But other times, he will act as a leader when he should be acting as a brother. And other times he would play off the role of a brother when he should be a leader. Such for example when Donnie wanted to go after Vizioso. The way Leo scolds Donnie is as a leader to an underling. And at the time he feels that’s the role he needs to be in because he doesn’t see things other what is important at the moment. At time getting the heart in order to prevent Shredder from being reserected was more important then any issues Donnie was going through. But if he had approached Donnie as a big brother, by saying “D, what is really going on? Because this is not normal behavior from you.” Then maybe he could have had a better understanding of Donnie’s mindset. It wouldn’t have changed much, but Leo would more likely have told Donnie to stay since they would see him as too involved in the situation. He knows he can’t be the brother each of his bros want him to be, but he tries to be the one they need him to be. He loves all of them and relates to them each differently, but finds he can’t be partial to one without looking like he’s picking favorites. But he can’t ignore another one without looking like he’s neglecting them so it becomes a matter of who needs his attention more. With Raph being a handful and Mikey often needing attention Leo has at times unintentionally given his remaining brother the shaft when he needs him most. In addition to this responcibility placed upon his young shoulders, he also has a geeky side which does remind us that he is still a kid at heart. Raph being the muscle is the protective one of the family. He feels it’s his job to protect his brothers and companions has felt this was his role ever since he was a toddler. As the second oldest and one of the two middle children of the family he feels like he is perpetually in his older brothers shadow. As a result he shows aggression towards his older brother because it feels no matter what he does, Leo always does it better. And he shows dominance towards his younger brothers as a means of showing them tough love in order to drive them to improve in their fighting. But despite being a bully he does deeply care about his younger brothers and anyone who would hurt anyone in his family for any reason does make his **** list (he also isn’t above this same reproach). As the series progresses he finds being a bully approach doesn’t always garner the best results though he won’t sugar coat lessons his younger brothers need to learn either. He has a strong companionship with Mikey even going as far as to emotionally break down when he is injured. Donnie is the resident genius and pacifist of the group. He isn’t particularly arrogant about his inteligence, but he does view it as the one saving grace that makes him feel like he is a member of his team. Even the times the does preen or gloat about his accheavements are more like a desire for recognition then self absorbion. He is given a hard time about being a weaker fighter then the rest of his brothers, particularly by Raph. Though truth be told, if given the choice between working in his lab or participating in a fight he would likely choose working on his lab, but not without a lot of consideration of either option first. He hates the pacifist aspect about himself as it makes him feel like he feels like he doesn’t really belong or that he holds everyone back. Because of this there is a running gag in the beginning of the series where his weapon would be broken or destroyed because he doesn’t have any faith in it or his own abilities as a ninja. Even during the weapon origin for the four Turtles, Donnie gracefully does accept his bo staff but all the same does complain with some disappointment by saying “Oh man, it’s just a stick.” In all likelyhood, Donnie had been banking on the weapon he recieved being something that he felt would have proven his worth as a warrior. Ironicly the time where he is given Raph’s sai as a weapon he gives off an impression of it being a weapon he’s not really comfortable with. As a genius he does know his brothers depend on him to help keep the lair functioning and also to help in situations where mechanical ingenuity is needed. But this is all stuff he does on his own which does at times cause unitentional problems such as accidentally blowing up the lair or not factoring in that something he’s created for the purpose of healing would have negative results. And occasionally even his efforts alone are just not enough to save the situation as a result he feels distressed about this because he feels he let his family down. During the space arc he had found himself confronted with levels of intellect that both mirrored and exceeded his own. Being the smartest member of the team the other turtles don’t feel intimidated, but they do feel lost when it comes to technical issues. With the fugitoid it gave Donnie someone else he could really him someone he could measure himself against intellectually and also taste of what his brothers go through some times when he lapses into science babble. He is loyal to a fault though and strives to protect those he sees as family and companions and will protect them even at the cost of his own life. His strongest relationships among his brothers are with Leo and with Mikey for very different reasons. Leo is his older brother and of course leader and generally Donnie would loyally follow his older brothers lead. Though there are times where will disregard or turn against Leo’s orders because he doesn’t agree with them or he doesn’t see any reason to follow him. And on rare occasions when Leo crosses a line that just feels like a slap in the face for all of Donnie’s efforts. These disagreements don’t happen often and don’t last very long and there is general regret after all is said and done. With Mikey, Donnie often played the straight man for Mikey’s goofiness. But as the younger brothers of the team the two of them find commiseration in each other. Donnie is easily irritated by Mikey since he does often with stuff from the lab or has to have things explained to him more then once. But Mikey is also Donnie’s only younger brother and because of that he is protective of him. Though he will make comments at Mikey’s expense simply because he knows they will fly over his younger brothers head. Mikey is the resident knuckle head and youngest member of the family. He has the most optimistic view point and sees good in things his brothers fail to. At first he had the most childish mindset and a rather wild imagination which caused his brothers and even his father to have trouble taking him seriously. But as the series progresses he begins to show that he is capable of coming up solutions and resolving problems successfully. And can surprisingly figure out technology that Donnie finds challenging. Shredder was too blinded to see what he always had. His family was killed by the Hamato Clan. We don’t know the reason for that spacificly, but I don’t believe it was just for random reason. As far as we know, Oroku Saki’s birth parents could actually have been monsters. Shredder is found a as an infant and Hamato Yuuta makes the conscious decision to take pity on the child and raise him as his own. He and Hamato Yoshi were raised as brothers, who lived as both as friends and rivals. While both were cared for, Saki more then likely saw Yoshi as the favored son which caused some of his anger to fester. Years later they meet Tang Shen, and have a rivalry over her. Saki may have had a relationship with her for a time as he does ask her to take him back. Tang Shen at some point feels put off by him and runs to Yoshi instead. The two of them marry and have a child, but regardless of this Saki still wants to prove himself as the better man. Tang Shen is conflicted since she knows her husbend is devoted to his family and feels his clan should endure, but does not wish the life of a ninja upon her infant daughter. Hamato Yuuta is sick during the fall of the Hamato Clan, and it’s somewhat implied that he is dying. Since one of the five judges of the underworld does judge you based on the lies you told in life. He probably felt he would have a better chance of entering a peaceful realm by revealing the truth of Saki’s origins. So he calls his adopted son to his side and tells him who he truely is. Unfortunately, it doesn’t have the desired effect. Instead it only proves in Saki’s mind that Yoshi was the favored son because he was the true born son. Little mind that he was cared for, that didn’t stop the fact he was stolen from his family and was raised to believe he was part of the family who murdered his parents. Regardless of who his parents actually could have been. In anger he likely would have killed Hamato Yuuta before gathering together any ninja who would loyally serve him and told them that he is from the Foot Clan and the Hamato Clan no longer deserves the right to exist. Here he confronts Yoshi and Tang Shen. He give Tang Shen one last chance to choose where she belongs. Tang Shen however states that she has made her choice and begs her husbend and brother in law to stop this foolishness. Oroku Saki unfortunately is beyond all reasoning and attacks his former brother and friend. Yoshi also finds no choice but to lash out at Saki, but he still leaves Saki every out he could think of to see the error of this mind set. In an attempt to get them to cease their fight, Tang Shen steps between them and is struck down. Saki is horrified since he killed her by his hand. Before he can process the travesty of what he has done his face is horribly burned and disfigured. He makes his way outside and finds Miwa where she had been safely put underneath a stone lantern. Knowing that she was the last shred of Tang Shen he had left he raised her as his daughter and gave her the name of Karai. Figuring that Yoshi somehow survived the fire, he deludes himself in to believing that Yoshi was the one who killed Tang Shen because he “poisoned” her mind against him. As Karai grows, the Shredder raises her and trains her. He acts as a father must, though not so much the caring father side such as tending to her while she is sick. Getting down on the floor and playing with her or anything like that. But he did go through the motions of fatherhood for the most part. And when Karai displeased him in any way, there are hints of him being abusive towards her. Over the years he cared for her, yes he did come to love her as his own child. But he also hated her because he would always see Hamato Yoshi’s features in her face. Every single day, seeing his enemies face in the face of his adopted daughter. So because of this he saw her as a tool for vengeance, a living weapon. How poetic it would be to see his enemy struck down by his flesh and blood. However, his teaching also had an unintended effect as well. Mourning the mother who she never got to know, and angry at the man who took her mother from her. Karai’s interests are purely focused on vengeance, but after meeting Splinter she becomes more unhinged in her desire to avenge her mother. After she learns that Splinter is her true father, she becomes blinded by the desire to seek vengance against the man who is truely responsible for destroying her life. After the Shredder’s death, when he faces Emma Daioh he is finally shown the scope of the ills he performed in life. And because of this he acknowledges that he doesn’t belong in the living world when he is forcing Kavaxas back into hell with him. For the first part I think Hamato Yuuta killed Sakis family because they wiped out the enemy clan and they were the head of that. I don't think Karai was purely focused on vengeance in the very start, that was more him, though she would wipe out her enemies and she was raised to do that she didn't want to kill Leo straight off, then with the Kraang she wanted to put vengeance aside to deal with something bigger. I do wonder what would have happened had the turtles not screwed up their alliance with her. Once Leo betrayed her then she went down the revenge road which was then, as you pointed out amplified when introduced to Splinter, she was more after him than anything after that. When she found out about Shredder, that would have felt like a massive betrayal, she'd been tricked all of her life.... but yes, she did inherit a vengeful flare from her up bringing. As for their relationship, we can mostly just guess on what was likely. No I don't see Shredder being the bedtime story type of guy either I didn't get the feeling that he also hated her though the thought that he would see his enemy in her did cross my mind, I figured maybe he saw Shen when I looked at her, he was willing to help raise her before Shen was killed. Trying to get her to kill her own father was evil but I don't know if it was hate for her or just that he was so focused on hurting Splinter that he had no regard for what he was doing to her. As for End Times, yes, though he came back still full of vengeance he did have tiny small redemption when he pushed Kavaxas back to where he came from. I also thought that showed his strength to break free of the control he was under. Last edited by newfan; 01-06-2018 at 06:57 AM.